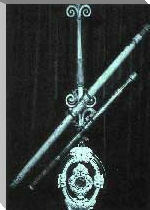 Did you know that in the early 17th century, craftsmen and scientists introduced a new tool for studying the heavens. The telescope, one of the central instruments of the Scientific Revolution, soon became the astronomer's most essential tool. Now the astronomer could see countless stars and other faint objects never before visible. Suddenly the universe was no longer limited to what the naked eye could see. As telescopes improved, astronomers continued to push back the boundaries of the known universe, peering ever deeper into the surrounding sea of stars known as the Milky Way. 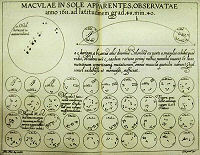 the Sunspot plate from Christoph Scheiner's Tres Epistolae See Biblioteca Digitale Where you'll find a copy of the original text - in latin.